Need a product not in our standard line? We can design and manufacture a spring steel fastener to fit your application and specifications. If you can describe it, we can make it. 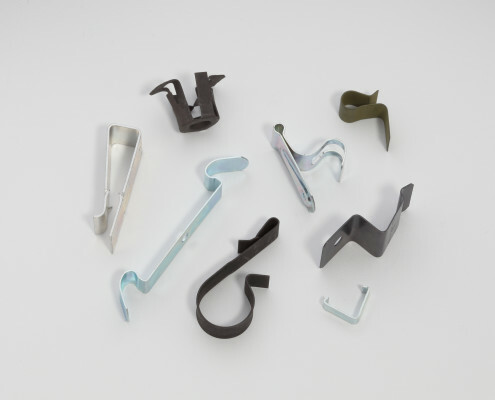 In addition to our extensive catalog of spring steel fasteners, Die Co. designs and manufactures many custom parts. Send us your design – or have us design the part based on your requirements. We will strive to produce the highest quality product, that meets all of your performance specifications, at a competitive price. Listen to you. Designing and producing a custom-made fastener always begins with careful listening. Our engineering team will work with your team, asking the right questions to thoroughly understand your application and needs. Offer our expertise. Drawing from our wealth of knowledge and experience, we’ll design the most efficient and economical spring steel fastener for your job. Create a tool and die. Using our years of experience, we’ll produce a tool and die for your product, guaranteeing manufacturing reliability, accuracy and repeatability. Monitor production. With our computer-assisted statistical process control (SPC), we will monitor production of your product to ensure and maintain established tolerances. Add finishing touches. All heat-treating and specialty-finishing processes are available in-house or locally, so we can make sure your job is done right and on time. You’ll notice our attention to detail in every step of the process. We’re ready to help. Let’s talk about the spring steel fastener you need. Email us to get started – or call us at 440-942-8856. We look forward to partnering with you. Not sure if you need a custom product? One of our fastener experts can advise you on standard Die Co. products that may be just what you need. Email a Die Co. representative – or call 440-942-8856 – to find or create the best spring steel fastener for your application. Learn more about standard Die Co. products in our product catalog or check for a competitor part on our cross reference list.